Malaysia’s south-western coastal state and the country’s historical heart, Malacca, has many aces up its sleeve. The destination is extremely popular amongst travel enthusiasts. Steeped in culture, history, and traditions, this coastal state allows you a peek into the Malaysian way of life through its many museums, architectural, gastronomic delights, and plenty of places to visit in Malacca. 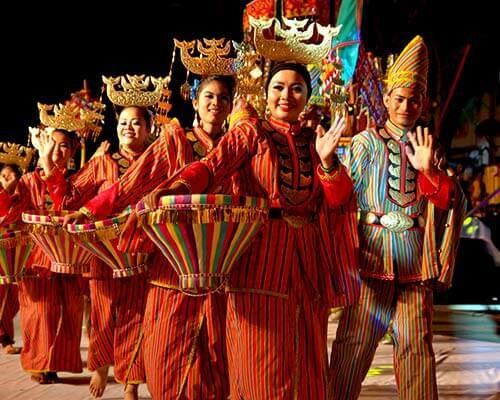 Malacca is truly a melting pot of cultures with its unique blend of Chinese, Portuguese and Dutch influences. A UNESCO World Heritage Site, the capital city of Malacca is a rollercoaster ride of visual and sensory delights. You can either take a leisurely stroll through the historical center or a ride in the vibrant and quirky ‘trishaw’ to soak in the flavor of this culturally rich city. Must-visit attractions: Baba Nyonya Heritage Museum, Christ Church, Cheng Hoon Teng Temple (exquisite engraved woodwork), Stadhuys, Melaka Sultanate Palace, A’Famosa (Portuguese ruins), Eye on Melaka, Melaka River Cruise, Jonker Street (for antiques, knick-knacks, and tantalizing traditional food). Do not miss: Friday and Saturday Jonker Walk Night Market is the best place to visit in Malacca at night. You must sample the fried egg ice-cream and Nyonya pineapple tarts. 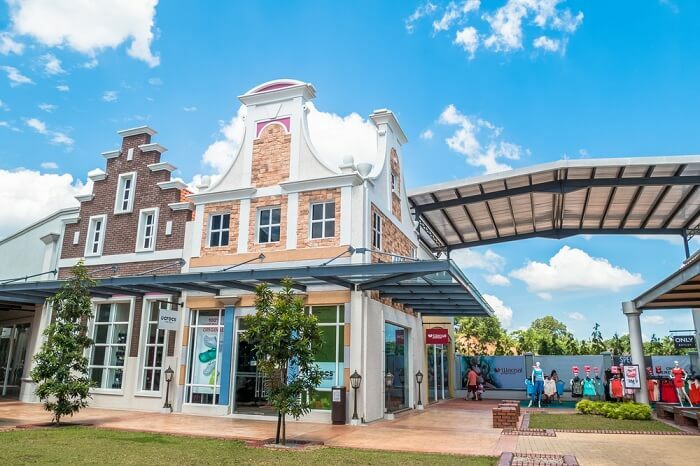 Just 24 Kms north of Malacca City is the lush and laidback countryside town of Alor Gajah, counted among the top places to visit in Malacca, Malaysia. While the tranquil town square is a nice spot for a stroll amidst pretty shops, the highlight of the town is the renowned A’Famosa Resort. Sprawled over 1300 acres, this haven of leisure is a unique and magical world with several theme parks and a golf course within it making it one of the most interesting places to visit in Malacca. You should definitely consider visiting here. Must-visit attractions: Animal World Safari, Water Theme Park, Cowboy Town. 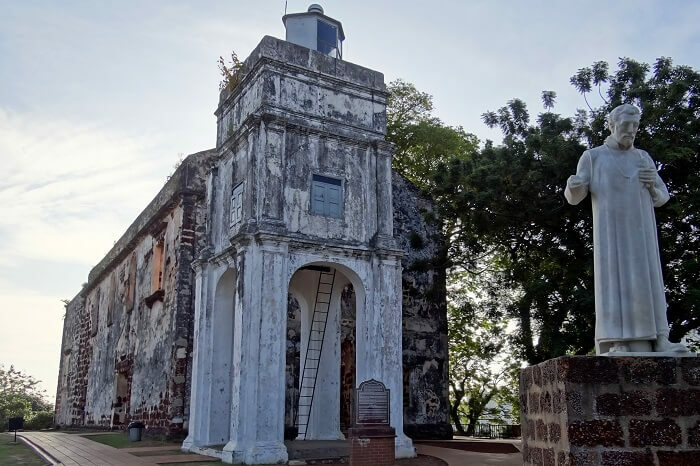 Located along the Malacca Strait this coastal town just a two-hour drive away from Kuala Lumpur has some unique attractions making it one of the best places to visit in Malacca town. 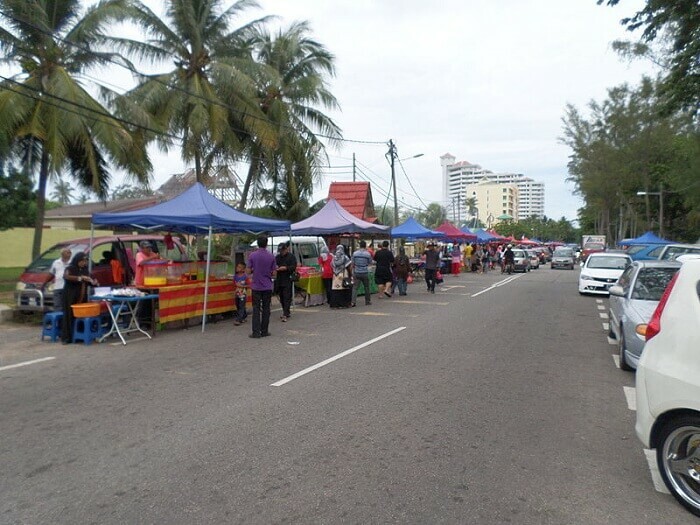 The Klebang beach is a nice area to take a leisurely stroll, play in the sand and enjoy kite flying with the kids. 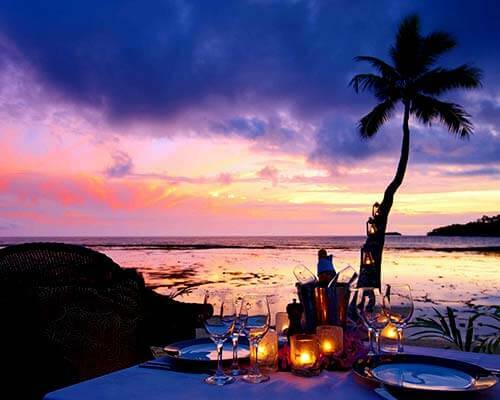 Do not miss on sipping the delicious coconut shake while gazing at a pretty sunset. 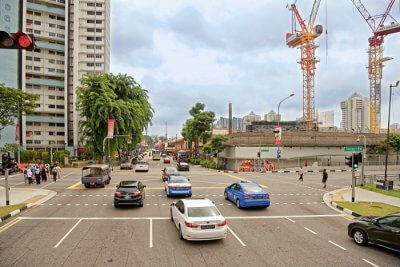 It is the best places to visit in Malacca city. Must-visit attractions: The Submarine Museum (offers a chance to visit a real submarine converted to a museum), Pantai Klebang Sand Dunes (a stunningly beautiful stretch of white sand dunes changing hues with the setting sun. 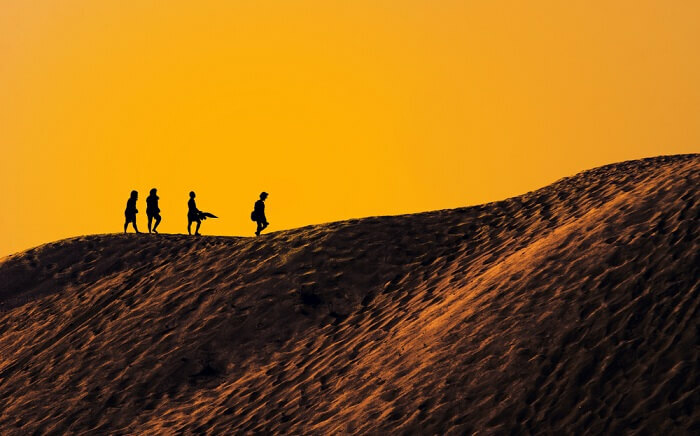 Adventure enthusiast can indulge in sand-boarding). 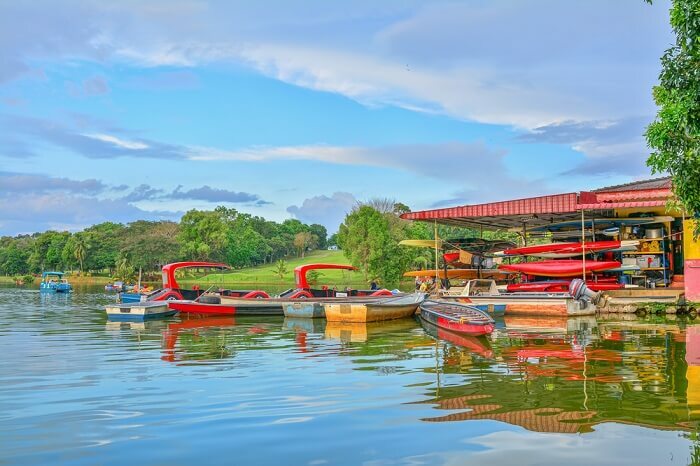 Those looking for places to visit in Malacca bathed in nature’s splendor amidst lush greenery and soaring trees can make a visit to Ayer Keroh. 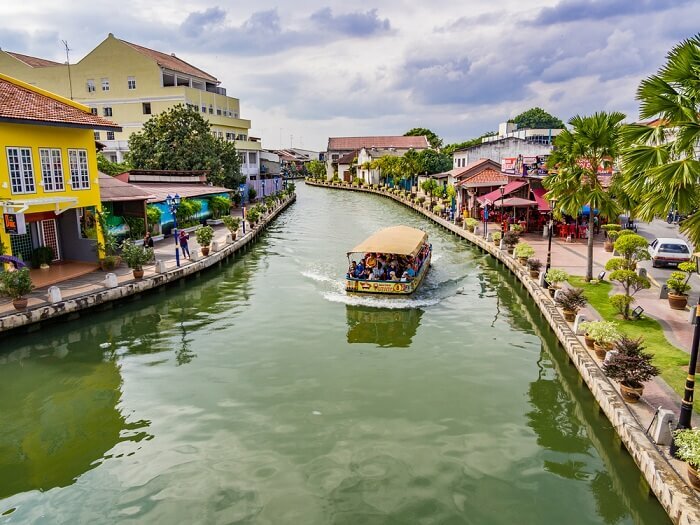 The laid back vibe of this backwater town just 15Km outside Malacca city allows you to spend a relaxed and fun-filled day with the kids and family. The Butterfly and Reptile Sanctuary as well as Melaka Zoo (with an exciting night safari) are great spots to keep the kids engaged and amazed. 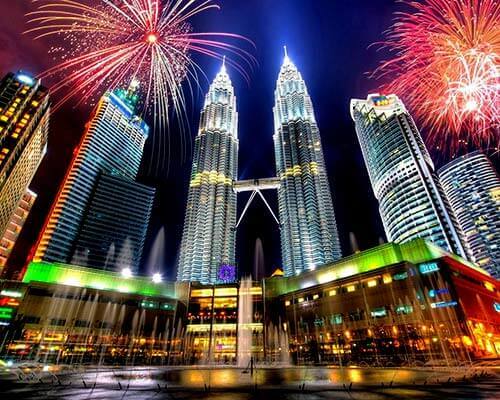 Must-visit attractions: Mini Malaysia and ASEAN Cultural Park, Malacca Crocodile Farm, Melaka Botanical Garden, Melaka Wonderland Theme Park and Resort (nestled amidst 60 hectares of forests and home to 16 thrilling attractions and rides). 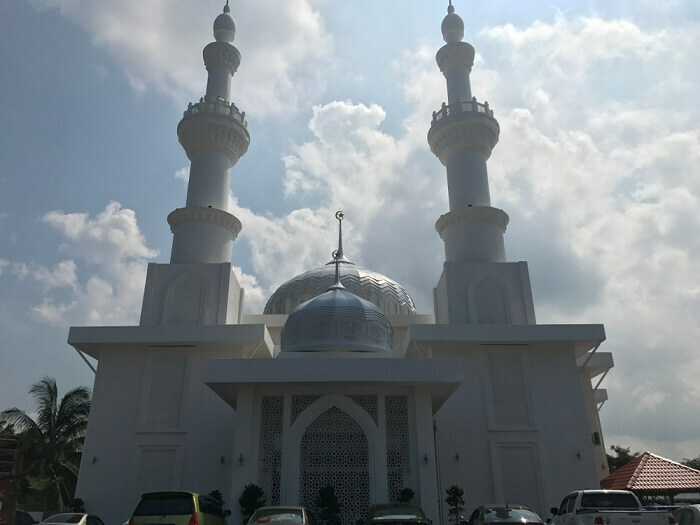 Located in the Alor Gajah district, Masjid Tanah is one of the largest towns and best places to visit in Malacca for outdoor activities. With some of the best hiking trails in the state as well as beautiful beaches around, it’s a great getaway for adventure enthusiasts and beach bums alike. 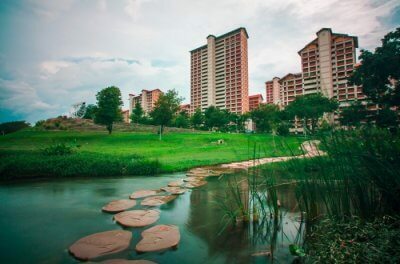 Add to this a turtle hatchery and a lovely waterfront with some of the best restaurants in Malacca offering delectable seafood and you’ve got the recipe for a perfect holiday. 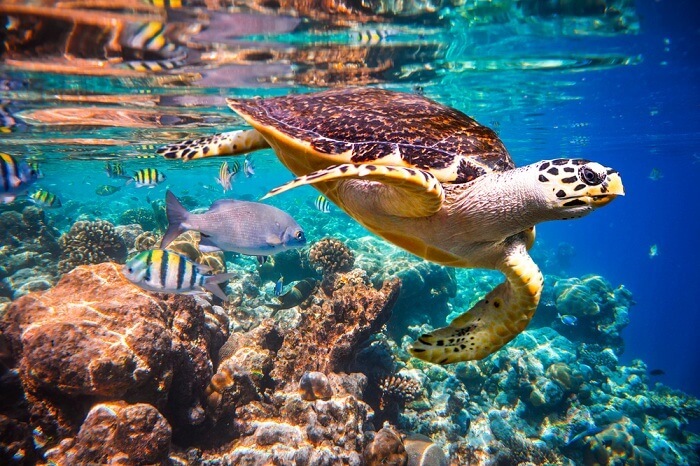 Must-visit attractions: Turtle Information Centre (with a chance to hold some endangered species in your hands), Sungai Udang Recreational Forest, Tanjung Bidara and Pengkalan Balak Beaches, The Al-Khawarizmi Astronomy Complex. 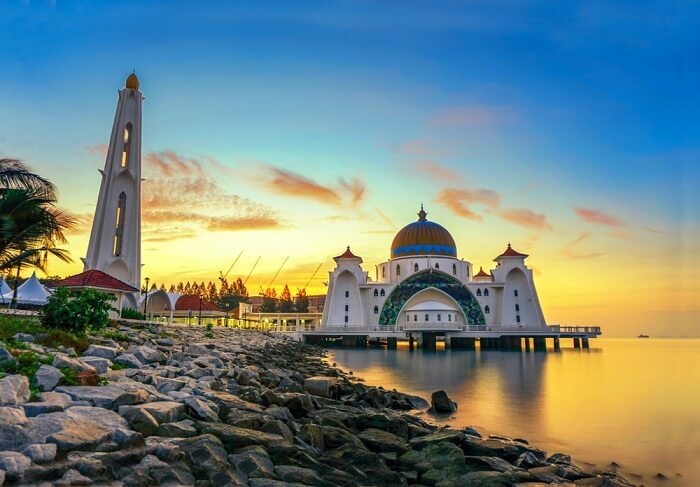 Though a part of Malacca city, this man-made island is also a special destination in itself and must be on top of your list of places to visit in Malacca. Along with its buzz and beaches, this tiny island is special because of the visually stunning and tranquil Melaka Straits Mosque. 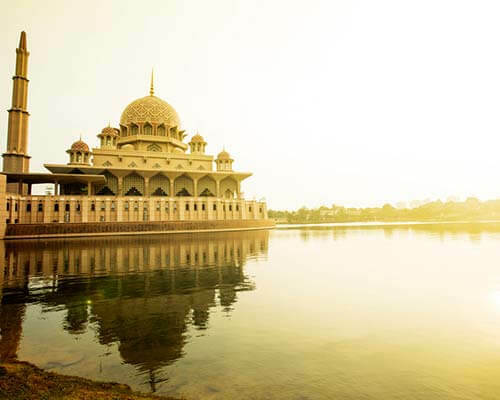 Also called the floating mosque, this gorgeously designed place of worship also offers breathtaking sunset views. You’ll be blown away by the mesmerizing view. So, make sure to stop by here. The southernmost district of the State is one of the popular Malacca tourist attractions owing to the rejuvenating hot springs located here. Jasin Hot Springs, based on the Japanese onsen concept offers pools with varying degrees of rejuvenating thermal water. You can take a relaxing dip in the healing waters while the kids can enjoy the inflatable slides and kids’ pools. 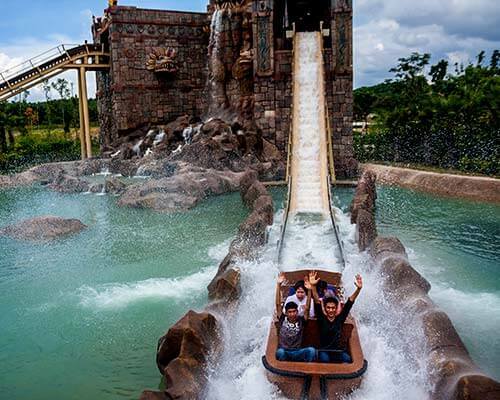 Though the maintenance is average, this reasonably priced attraction is one of the best places to visit near Malacca to unwind. 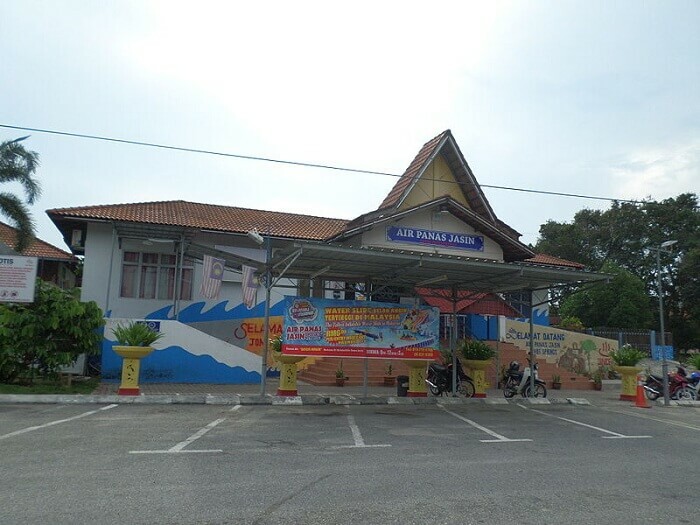 Tanjung Kling is well-known for its gorgeous Puteri beach and the tomb of one of the greatest Malay warriors. The 2.5km stretch of beach offers panoramic views and is a wonderful place to put your feet up and relax, relish the local food at the food stalls or hang out in the night market along the shore. This is one of the best places to visit in Malacca at night. You can also visit the Hang Tuah mausoleum to pay homage to the legendary warrior and get an insight into his life. Also called the Big Island, this mystical island off the south-east coast of Malacca is a great choice for places to visit in Malacca for a memorable day trip. The island is frequented by spirituality seekers who come to visit the meditation caves of Muslim mystics. You can also choose to simply relax at the palm-shaded beaches soaking in the tranquility and natural beauty of this Instagrammable place in Malacca. Jungle hiking is also a rewarding experience for outdoor junkies. A small island off the coast makes it to the list of Malacca attractions for its tranquil setting away from the bustle of city life. Popular amongst both locals and tourists, Pulau Upeh is also the breeding site for the endangered Hawksbills turtle. Visitors can catch a glimpse of their nesting on the beach during March-June. Can it get any better than this? Make sure to stop by this destination for scenic views. If you want to get background information on the Dutch possession of Malaysia, stop by Red Square. 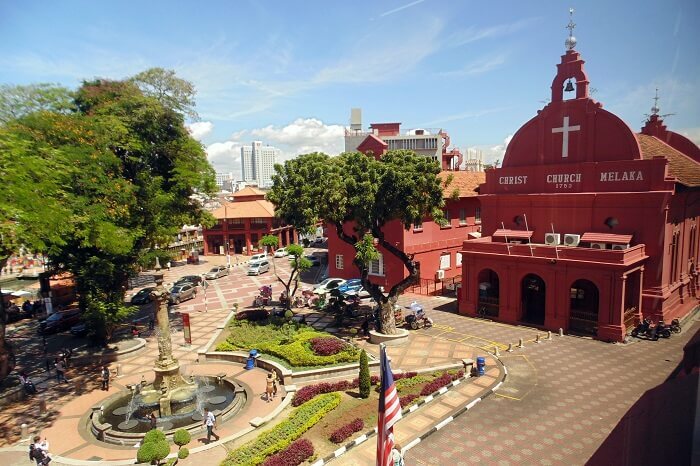 You will come across two prominent landmarks in Malacca, which includes the Christ Church and the Old Town Hall. Hop on a trishaw ride and indulge yourself in some souvenir shopping. We promise you’ll have the time of your life and you won’t be disappointed. Located at the top of St. Paul’s Hill, the St. Paul’s Church ruins make for some photography shots. After a brief hike, you can have some amazing views of the city of Malacca. Make sure to carry your camera with you. 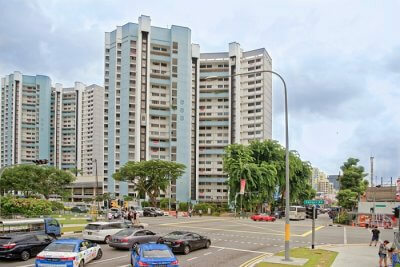 The place has been well maintained by the local authorities. The tombstone and the relic inscriptions will allow you to get a detailed insight into the history of the church. You’ll be convinced to visit Malacca again and again. Now that you know all about this gem called Malacca, book a trip to Malaysia at the earliest and share your offbeat experience with the world. These places will provide you with a unique and awesome experience on your trip. Make sure to stop by as many places to visit in Malacca that we’ve shortlisted as you can. You will have the time of your life here amidst beautiful sunsets and scenic views of the beach.